An illustrated tribute to the most brilliant code-breaker you’ve never heard of. 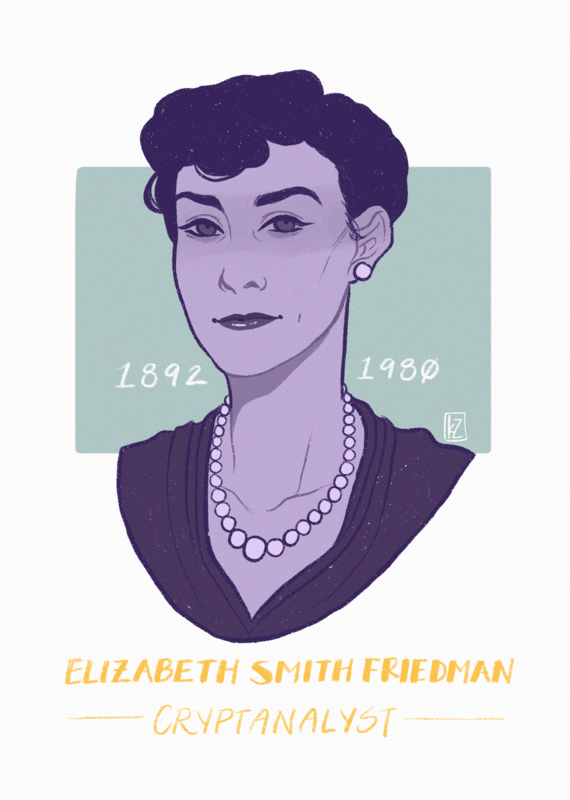 Ever since reading The Woman Who Smashed Codes by Jason Fagone, I have been fascinated by the life of Elizabeth Smith Friedman, a woman who was by all means a pioneer and an American hero. Despite founding one of the first facilities dedicated to the study of cryptography in the US and pioneering many of the foundational principles and techniques still used in code-breaking today, much of her accomplishments were overshadowed by her husband and much of her work was hidden away in government vaults. The more I learned about her and her contributions to US war efforts, espionage, and domestic crime–including cracking difficult Enigma machine and JN25 codes, decoding rum-runner messages during Prohibition, and deciphering encoded letters containing naval movement in preparation for the Pearl Harbor attacks–the angrier I felt. I felt angry for her being forgotten in the annals of history, angry as a woman. It felt reprehensible to me that, due largely in part to sexism, her incredible story had been overlooked for so long. While an illustration drawn by some random college student in Georgia is far from the praise and recognition she deserves, I hope to convey my feelings of gratitude and admiration for her brilliance, no matter how insignificant the gesture. Katie Zong is a third year Biology and Neuroscience major at Georgia Tech. Her hobbies include reading about bizarre science, drawing, and crying about said drawings. What’s The Connection Between Complex Chemistry and Islamic Medieval Architecture?